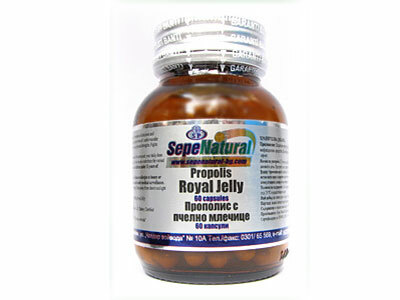 Convenient form for transportation and storage of royal jelly at room temperature . Usage: 2-3 times a day, one capsule before meals. Not more than 900 mg daily. Do not exceed the daily dose. The product is not a medicine. Do not use as a substitute for a varied diet. Do not take at evening and bedtime. Do not take in case of an allergy to bee products. It represents a highly nutritious and digestible substance. Contains the necessary elements for a normal life. Enhances the appetite and increases the metabolism, creates an alertness,the mood and tidal forces, enhances the immune system, improves the function of the endocrine glands, stimulates blood formation and slows the aging process. It is shown is the active influence of the royal jelly on a metabolism,a regulation of CNS and a tissue respiration. Improves the performance, reduces fatigue , in an increased body mass, accelerates a growth, improves an appetite and a sleep.The Royal jelly stimulates the action of the two tabs of the autonomic nervous system - the sympathetic and parasympathetic and the result is that normalizes blood pressure. When you suffer from high blood pressure is to be lowered and vice versa.The increased erythrocyte and reticulocyte hemoglobin in the blood. Contributes to the development of the adrenal hormone adrenaline. Upon systemic application of royal jelly is observe a regulation of metabolism, the contractile ability of the heart muscle, dilation of coronary vessels and a smooth muscle of the bronchi. Regulates the glucose utilization in the body and the fat metabolism.Affects the endocrine system, sexual frigidity, lactation and longevity. Can find many reasons for folic acid in royal jelly. It the proportion of B vitamins is most balanced, leading to maximum beneficial effect on the organism.